Simple Couscous Salad, Thyme for Cooking summer sides. Couscous does not have to be dry and boring. It also doesn't need cooking which makes it the perfect fast food. Heat the stock, do a bit of chopping and you're done! Plus it's a dish that can help clean out the fridge. Heat chicken broth to a boil. 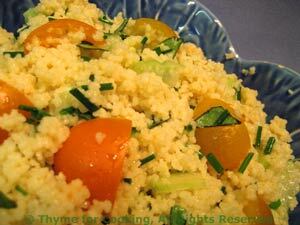 When couscous is done, add chives, tomatoes and celery and fluff gently with a fork to combine. Put the vinegar, mustard and oil in a small bowl. Whisk well and stir into couscous. Serve.